DAMASCUS, Jan. 20 (Xinhua) -- Three Turkish F-16 jets on Saturday carried out 11 airstrikes on Kurdish positions on the outskirts of Kurdish-held Afrin in northern Syria near the Turkish border, marking the official beginning of the Turkish military campaign against the Syrian Kurdish fighters in the region, pan-Arab al-Mayadeen TV reported. The airstrikes targeted villages in the surroundings of Afrin in the northern countryside of Aleppo, the report said. 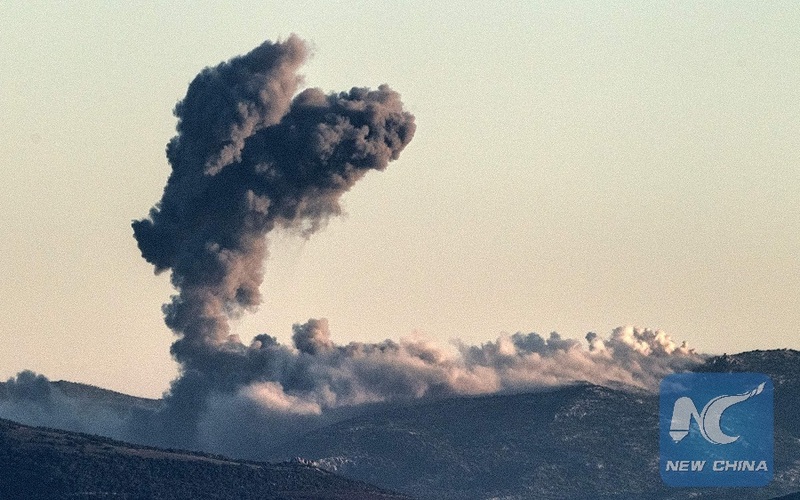 The Kurdish-led Syrian Democratic Forces (SDF) said Turkish airstrikes targeted the city of Afrin and the towns of Sherowa, Shiran, Jandaris and Rajo on the city's outskirts. Meanwhile, the Manbij Military Council, which is affiliated with the SDF, said the Turkey-backed Free Syrian Army (FSA) rebels started an attack on Saturday against Kurdish groups in the countryside of Manbij in the northern countryside of Aleppo. The FSA in the city of Mare in northern Aleppo also shelled the positions of the Kurdish-led groups in the Tal Rifat and Sad al-Shahba areas, which are under the control of the Kurdish forces. Turkish Prime Minister Binali Yildirim said on Saturday that Turkish warplanes started the military campaign against Afrin, adding that the aim of the offensive is to eliminate the fighters of the Kurdish Democratic Union Party (PYD) and the Kurdistan Workers' Party (PKK). A day earlier, the Kurdish People's Defense Units (YPG) said Turkish artillery had heavily pounded the positions of the U.S.-backed Kurdish fighters in Afrin since midnight Friday. "Afrin people suffer material damage as artillery and missile attacks continue unceasingly," the YPG said, adding that it will respond strongly to the Turkish attacks. On Friday, Turkish Defense Minister Nurettin Canikli said Turkey's operation in Afrin had "de facto" begun with cross-border shelling. The battle of Afrin has been long anticipated, as Turkey made clear that it was going to unleash an offensive along with the Ankara-backed Syrian rebels against the YPG in Afrin. Turkey deems the YPG as a terror group belonging to the Kurdistan Workers Party (PKK). The United States, which heavily backs the Kurdish forces and see them as reliable allies in Syria, has urged Turkey not to fight the Kurds in Afrin, while the Syrian government has warned it would shoot down any Turkish warplane fighting in Afrin. Turkey's military operation in Afrin will deal a strong blow to the Kurdish fighters and weaken their growing influence in northern Syria near Turkey, particularly after the Kurdish forces defeated the Islamic State in Syria's northern province of Raqqa, the former de facto capital of the IS, and after the recent U.S. declaration that Washington is forming 30,000-strong border forces from the SDF and other Kurdish fighters in northern Syria. Ankara fears the separatist sentiment of Syria's Kurds could inspire Turkey's 14 million Kurds and pose threats to Turkey's southern border, where the PKK has been active for years.